I was born in February 1943. 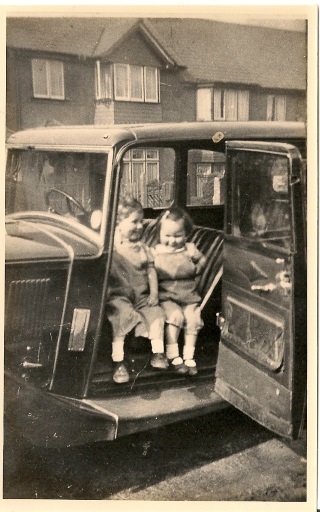 After my mother gave birth to my sister in July 1944, she apparently found it difficult to look after me, so, in my father’s absence in the RAF overseas, she agreed to place me in the care of her estranged half-sister (Gladys) who lived with her husband and her daughter Pamela, in St Albans, Hertfordshire. The deal was brokered, I believe, by my Auntie Joan, another half-sister who lived with us in the rented house in Tokyngton Avenue, Wembley, and has visited us many times over the years since those days. Barbara was the daughter of one of my mother’s brothers (i.e one of my uncles) and was about the same age as her cousin Pamela. Both Pamela and Barbara would have been a few years older than me. It’s far from clear how long I was fostered in St. Albans because there are at least two versions of this story, my mum’s and Auntie Joan’s. In my mum’s version, Gladys was reluctant to give me back, but according to Auntie Joan, the reverse was true – my mum prevaricated and had to persuaded to take me back. I suppose I could have made some effort as an adult to trace my auntie Gladys, but I was advised this was a bad idea. When I did come home it was to a rented house in Tokyngton Avenue, Wembley. I don’t recall the number, but I do remember that the house overlooked the railway yards that run parallel to the Harrow Road, and was built on a slope. I remember hearing the trains, and lots of bangs and crashes which were later identified as coming from a nearby anti-aircraft battery. I also remember playing with my sister and my cousin Patsy on the quite steep steps in the front garden which led on to the pavement. I was particularly keen on the snails that lived there. Next door they had a solitary white duck that lived on a minute garden pond in their back garden and quacked a lot until one day it quacked no more. I also have an image of lots of men in uniform in our back garden, drinking and having a high old time. Today Tokyngton Avenue looks like many another suburban street. A bit of basic research tells me the average house price there is around £500,000 and that many of the houses have been divided into flats, valued around £250,000. Of course they will have been much improved since then, with all mod-cons and bathrooms, but just after the war we were content with a tin bath in front of the fire. We shared the house with two of my mother’s half-sisters and their families, though I can’t imagine how we all fitted in. Auntie Joan and Uncle Arthur had no children, but Auntie Ellen and Uncle Fred had a daughter called Patsy, and I do remember the birth of their second daughter Sylvia – or at least I remember a lot of noise and fuss which I later identified as her birth. Uncle Arthur had been in the Army in Burma, and Uncle Fred in the RAF. We lived there until 1947, when we moved into a prefab in Pilgrims Way on Barn Hill, between Wembley Park and Kingsbury, qualifying under Winston Churchill’s post-war emergency rehousing scheme. My recollections of the interior are mainly of two tables, the draw leaf dining table, which I have inherited, and a huge billiard table which nearly filled the front room. The dining table was of a type then known as “utility furniture” but is probably now classified as “vintage”. It came with matching chairs which I remember vividly because I ran into one of them and split my forehead. I still bear a faint scar over my right eye. In this recent picture taken in my kitchen in Lincolnshire, the table has been stripped; originally it was stained and polished in the ubiquitous dark brown that was the fashion in those days. You can see similar tables with pull-out leaves in antique shops to this day. Built mainly from oak, this furniture was built to last, and though I don’t remember it, apparently I used to sit under it during air raids, happily making boom-boom noises. I refuse to part with it now, despite sarcastic comments. I have no idea where the billiard table came from, but, given those dodgy post war times, I suspect it might have been “acquired” from a club or a pub. It came with a scoreboard, balls and cues, so the dining room resembled a gentleman’s games room. To be fair, it was occasionally used for dining, thanks to two solid wooden covers which transformed it into a dining table. I faintly recall that my mum and aunts also used it as a cutting table when they made our clothes. The clothes you see in the pictures of us were all home-made, using the good old hand-cranked Singer sewing machine. I still don’t know much about the story of my mother Alice’s family, but from what I have been told she was from a large working class family called Godden, who lived in Paddington before the first world war, and she was the third eldest of four siblings. Born in 1908, as a girl she contracted and survived rheumatic fever, but in later life learned that this had damaged her heart. She was also apparently knocked down by a horse tram in the Harrow Road. Her father died after getting trapped in a manhole, and her mother Annie remarried a german Baker called Prinz, who later changed his name to Prince to avoid discrimination during the war. 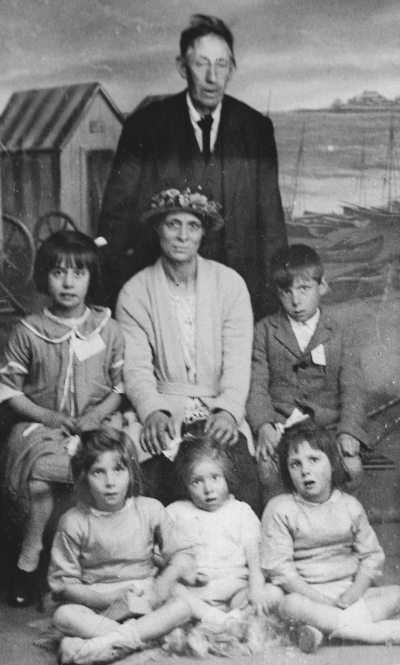 Her mother bore five more children, half-brothers and sisters to the Goddens before she died in 1930, aged 46, leaving nine orphans. When her mother died Alice was “in service”, i.e worked as a domestic servant, and she and her eldest brother Bert tried to set up home and look after all the other siblings, but failed for whatever reasons. The Prince girls were fostered in a Shaftsbury children’s home in Esher (Esher Place), and the others presumably fended for themselves. That’s the short version, but its significance is, I believe, that Alice tried to hide this failure, as she felt it to be, from me and my sister. I believe it haunted her for the rest of her life. My father Henry was the youngest of four brothers, and he was introduced to Alice by Nellie Dewrance, the wife of his elder brother Bert, who later emigrated to Perth, Australia. Dad rarely spoke about his early life, but we do know that he had no secondary education and joined the Post Office as a telegraph boy, later becoming a postman in London. His eldest brother Jack had fought in the Boer War and later married a woman from Lowestoft, known to us as Auntie Lill. His brother Ted was, according to Henry, favouritised by their mother, a source of resentment by Henry. I have no memory of Henry before we moved to the prefab, but this photograph, which I found in an old biscuit tin, may have been taken before then. The daft looking one is me. Another clear memory I have of life in Tokyngton Avenue was bathtime, when we used to get washed in the tin bath in front of the fire. Think I’m kidding? I do remember this vividly, and the thrill of not getting scalded as fresh hot water was poured into the tub. That’s not us in the tin bath but you get the idea. I think this is the Prince Family. The lady in the middle is probably Annie Prince, formerly Godden, the grandmother I never knew. On either side of her are Gladys and Jim, with Joan, Ruby and Ellen sitting in the front row. I presume the man is Mr Prince. Funeral invitation. 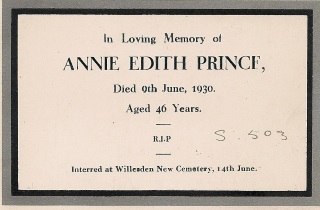 I think this must mean that Annie had nine children before she died of cervical cancer at the age of 46! 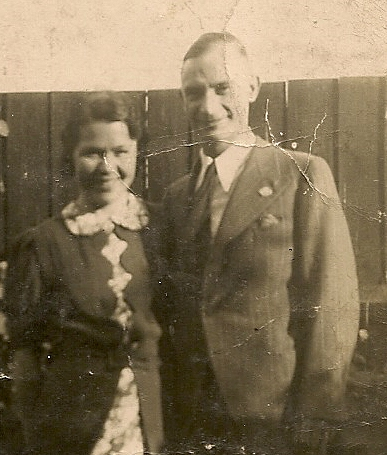 I think this photo of mum and dad might have been taken during this period. Dad was very proud of his demob suit. This entry was posted in Everything else!, Memoirs and tagged 1943, 1944, 1947, anti-aircraft, Army, aunts, bathtime, billiard table, Burma, cousins, Dewrance, Esher, estranged, Godden, grandmother, guilt, half-sister, Harrow Road, Kingsbury, Lowestoft, Luton, Memories, Post Office, Postman, prefabs, Prince, Prinz, RAF, railways, sewing machine, Shaftsbury, St. Albans, tin bath, Tokyngton Avenue, uncles, utility furniture, Vauxhall, Wembley by peterdewrance. Bookmark the permalink. Thanks Paul – strange thing, the more I write the more I remember.